It’s been all excitement here since we knew that Mr. Titchmarsh was coming to film the garden next week, tinged, I have to admit, with a heck of a lot of anxiety. What if it’s raining? What if nothing is in flower? Will all my blossom be over? Will Alan ( I feel I can call Mr. Titchmarsh ‘Alan’ as we are, I’m sure, about to become best friends…) , will he even like it? Should I buy more plants just to make sure? Well, I’m sure you can guess the answer to that last question…….. I also couldn’t resist this container which I’ll fill with something with small ethereal flowers, maybe a little pink diascia trailing down? I love anything slightly rusty, don’y you? But the alliums are still tight in bud. 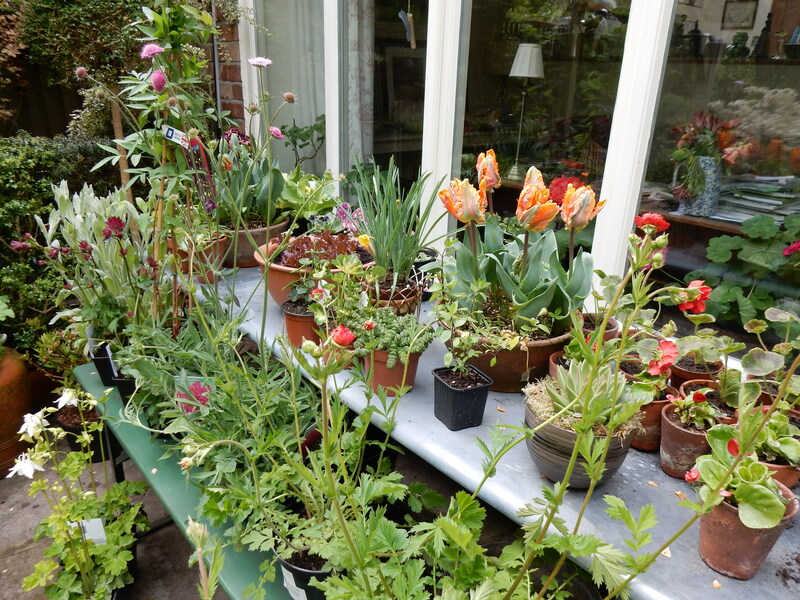 Perhaps I should get a warm hairdryer on them to force them open like they do at Chelsea Flower Show…. But some things are opening too fast like these gorgeous parrot tulips- perhaps I should put them in a giant fridge to hold them back?! So , we’re nearly ready for Alan, I hope- let’s just hope it doesn’t rain. I’ll let you know how we get on next week. Wish us luck! Thanks Ann, you can visit again! I think it looks wonderful and am excited for you. Looking forward to it. Wonderful garden..wishing you the best. It will look splendid! And I thought opening for Chorlton Open Gardens was stressful, that’s nothing compared with being on the telly with Alan. All good wishes for the filming. I love your garden, I love that you’re twitter pated, and I LOVE LOVE LOVE that you’re lucky (and good) enough to have Alan Titchmarch coming to call. Well done and good luck with it!